Robert Freed is a senior counsel in Dykema's Minneapolis office. 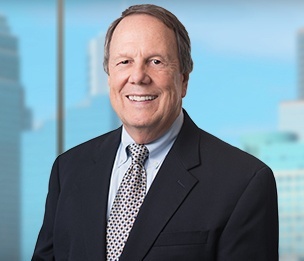 Bob counsels clients in all aspects of patent, trademark and copyright law along with related due diligence, licensing and strategic planning. Bob graduated from St. Olaf College in 1971 with a Bachelor of Arts in Chemistry. He earned a Master of Science and Doctorate in Food Science (minor in Biochemistry) from the University of Wisconsin-Madison. Before entering law school, he completed post-doctoral fellowships at the Food Research Institute at the University of Wisconsin-Madison and in the Department of Biochemistry at the University of Minnesota. Bob received his Juris Doctorate from the University of Wisconsin-Madison in 1986 and practiced law with Merchant & Gould where he was made a partner. He served as the sole Patent Counsel for Cytran International, Inc., a Seattle-based pharmaceutical development company, and for the Wisconsin Alumni Research Foundation (WARF) associated with the University of Wisconsin-Madison. He joined Moore & Hansen in Minneapolis in 1997 where he practiced for more than 20 years before joining Dykema.